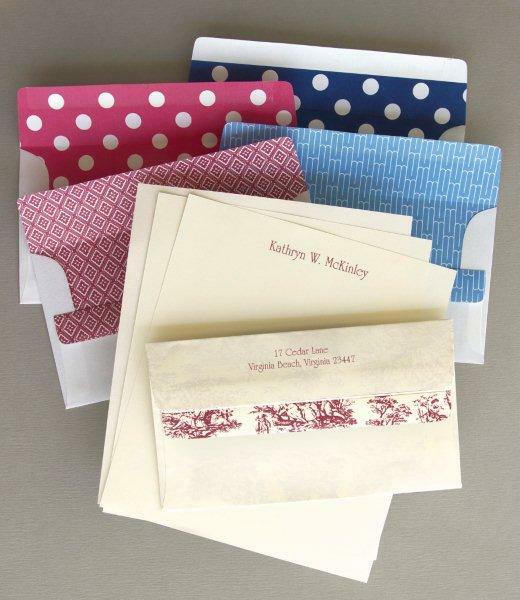 Description: Envelopes are 6.5" x 3.625" and sheets are 6"x7" are the perfect size for checks and small notes. Keep a pile of them at your desk or any place handy for sending a quick letter. Availalbe with lining: Navy Dot, Pink Dot, Blue Maze, Red Diamond or Wine Toile. Choose a font in cursive or block. Set up will be as shown on two lines for the envelope and one for the sheets.